*1. 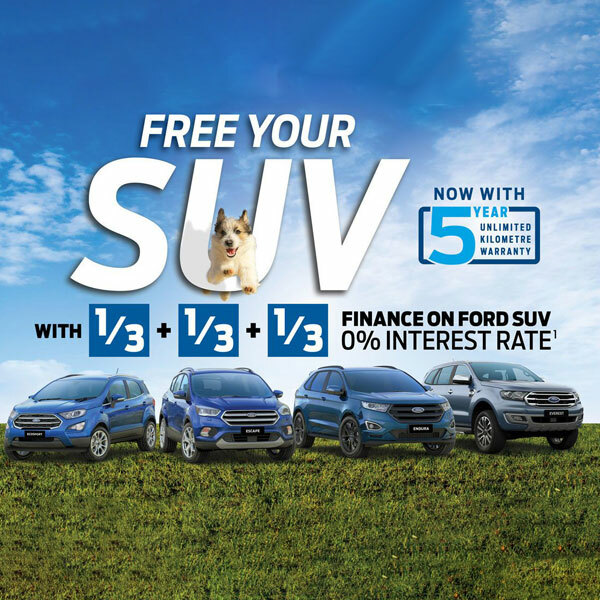 My Ford Finance 1/3, 1/3, 1/3 offer is available at participating Ford Dealers between 1 October 2018 and 31 December 2018 or while stocks last on selected new EcoSport, Escape, Endura or Everest. This offer is only available for private and GST customers. Customers must pay one third (1/3) of the Recommended Retail Price (“RRP”) up front plus any On Road Costs, any accessories fitted, a PPSR fee of $10.35, an establishment fee of $169 and a Dealer Origination fee of up to $250. A further one third (1/3) of the RRP is to be paid on the one year loan anniversary, with the final one third (1/3) of the RRP to be paid on the two year loan anniversary. An interest rate of 0% applies. 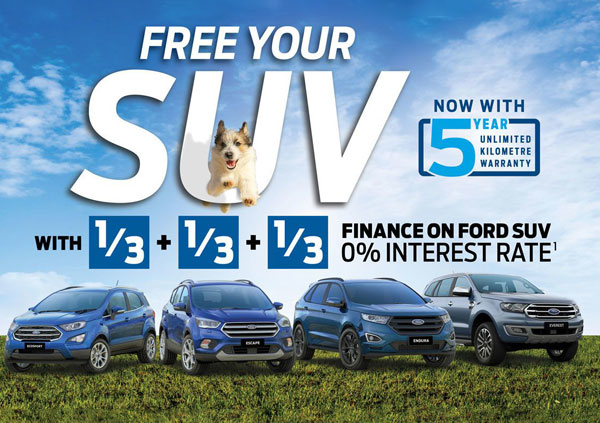 This My Ford Finance offer is based on RRP and is only available through UDC Finance Limited subject to UDC Finance Limited’s normal credit and lending criteria. This offer cannot be used in conjunction with any other offer. 2. Warranty conditions apply. Warranty period commences on the date of delivery except where the vehicle is a dealership, demonstration or service loaner vehicle, in which case it commences on the date on which it was first registered by an Authorised Ford Dealer. Tyres, tubes and supplier branded parts and accessories are excluded. Shock absorbers and batteries are subject to shorter warranty periods. Visit www.ford.co.nz/owners/warranty for further information.3. Special pricing is available until 31st December 2018, or while stocks last, at participating Ford New Zealand dealerships. The special price excludes on road costs, options and accessories and is not available in conjunction with any other special offers. Excludes MY2019 models.